NYC Health + Hospitals/Lincoln announced today the completed installation of state-of-the-art antimicrobial cooling towers. The towers not only support the heating, ventilation, and air conditioning system but also include antimicrobial features that significantly reduce the risk of harmful bacteria that sometimes grow in less advanced cooling towers. The modern towers are also expected to reduce energy consumption by about 40 percent, according to engineers. The new cooling towers replace ones that had reached their expected end of life. While the old ones never contributed to any health concerns in the community, leaders at the hospital nevertheless saw an opportunity to increase protections. Following research of replacements models, the cooling tower model selected was chosen because of several innovations. Enhanced safety to the community was a significant factor. The model selected has features that prevent or impede the potential growth of bacteria, including Legionella, which can cause a type of pneumonia commonly known as Legionnaires’ disease. The shells within the towers that hold the water are infused with an antimicrobial resin—wide-spectrum additives that operate on a cellular level to continuously disrupt and prevent uncontrolled growth of microorganisms and biofilm. In addition, while traditional metal cooling towers are vulnerable to corrosion from salt air and industrial gasses, the new towers’ high-density polyethylene design is resistant to such corrosion. Moreover, it is also resistant to the harsh chemicals required for use in treating the recirculating water and cleaning the towers. In addition the shells that hold the water have a rounded shape, as opposed to the boxy shape of traditional shells, with corners in which water moves less and bacterial growth can flourish. The rounded shapes do not allow water to become dangerously stagnant in spots. Another major appeal of the model was the promise of energy savings. To meet the city’s mandate to save on energy, NYC Health + Hospitals teamed up with the New York Power Authority, a state power organization dedicated to innovative and energy-efficient infrastructure. 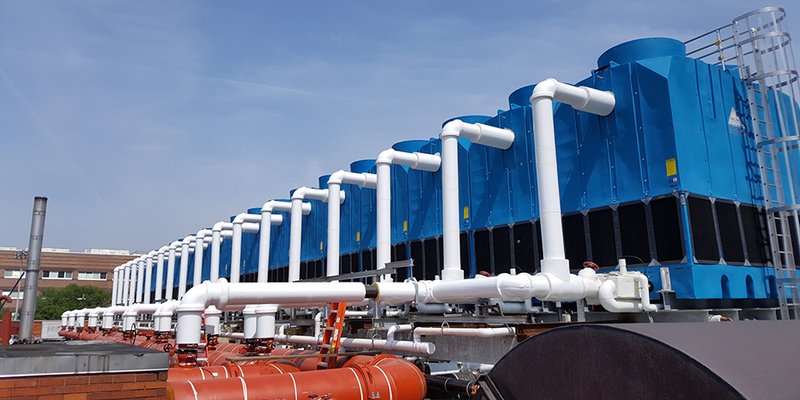 “We worked with New York Power Authority to ensure that the new cooling towers would be as energy-efficient as possible,” said Louis Iglhaut, associate executive director at NYC Health + Hospitals, who led the team responsible for selecting and installing the new cooling towers. “Our old towers used large, 48-horsepower fans on each unit, which required the use of a lot of electric power. The new modular units are equipped with smaller 5-horsepower, 18-inch fans, so the energy consumption is far less.” He adds that they also installed variable-frequency drives, which increase energy savings. The hospital is expected to yield energy savings of 40 percent compared to the operational costs of the retired system. The cooling towers were manufactured by Delta Cooling Towers. “We are very pleased that Lincoln was the first medical facility in the greater New York City area to adopt the anti-microbial tower, and while it is increasingly being selected as the cooling tower for a number of industries including health care, Lincoln was just the 6th facility nationwide to have it installed,” says John Flaherty, CEO of Delta Cooling Towers. The installation was handled without any disruption to hospital operations. Because of the modular nature of the towers, with each component smaller and lighter than the components of the old system, the installation team was able to use a small crane to lift the towers into position. NYC Health + Hospitals/Lincoln, located at 234 East 149th Street in the Bronx, is a 362-bed, Acute Care Level 1 Trauma Center with the busiest single site emergency department in the region. Recognized as a “2013 Top Performer on Key Quality Measures” by The Joint Commission, receiving top grades in Leapfrog Scores Safety in 2015 and 2017, and acknowledged with High Performing ranks in U.S. News & World Report in 2017 and 2018, the hospital emphasizes primary care and specialty medicine and uses the latest advances in medical science. It has designations as a Breast Center of Excellence, Breast Imaging Center of Excellence, Diabetes Education Center of Excellence, and others. Lincoln’s Primary Stroke Center has The Joint Commission’s Gold Seal of Approval and the American Heart Association/American Stroke Association’s Gold Plus and Target Plus Honor Elite awards. Its Hemodialysis Unit is The Joint Commission accredited, as is the hospital’s Palliative Care Service. NYC Health + Hospitals is the largest public health care system in the nation, serving more than a million New Yorkers annually in more than 70 patient care locations across the city’s five boroughs. A robust network of outpatient, neighborhood-based primary and specialty care centers anchors care coordination with the system’s trauma centers, nursing homes, post-acute care centers, home care agency, and MetroPlus health plan—all supported by 11 essential hospitals. Its diverse workforce of more than 42,000 employees is uniquely focused on empowering New Yorkers, without exception, to live the healthiest life possible. For more information, visit www.nychealthandhospitals.org and stay connected on Facebook at https://www.facebook.com/NYCHealthSystem or Twitter at @NYCHealthSystem.